It's that time of year when the stores are putting out their Back-to-School sales and us penny pinching teachers scoop up the great deals. Last night I found myself at Wal-Mart gathering my red polyvinyl two pocket folder, otherwise know as my Homework Folders and glue sticks. 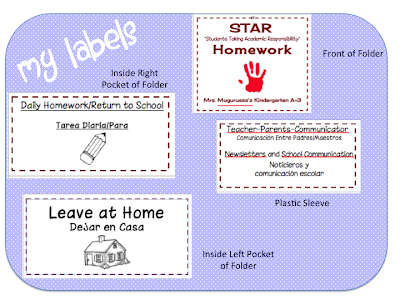 I'll be using the same homework folder labels I used last year for the cover, and the two inside pockets. I will also use a pencil pouch to hold flash cards. Each trimester our students receive flash cards for sight words, numbers and rhyming. I just bought the same folders at walmart Sunday! They were also a great price! 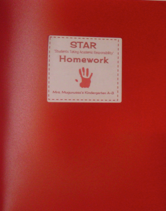 I am for the first time going to be using a S.T.A.R folder this year! I am very excited! I think the families will really appreciate the organization and communication! Your labels are cute! Katherine- I've used STAR for 12 years now. In second and third I used Binders, but the folders work well for kindergarten. Thanks for the great ideas! Does the school communication go in this folder as well?